This year marks the 71st birthday of the State of Israel. To celebrate, our Federation invited Greater MetroWest agencies and synagogues to submit proposals for funding of Israel@71 programming. The goal was to increase the quality of our community’s local programing while, at the same time, create a mosaic of Israel’s culture, history, and modern society that is accessible to the widest audience possible. Tuesday, May 7 • 7 p.m.
Join the Greater MetroWest community as we remember Israel’s fallen soldiers and victims of terror attacks. Following the ceremony, all are welcome to join us for a discussion exploring the meaning of Yom HaZikaron through Israeli music. We will also gratefully accept any donations of packaged sweets and snacks to send to Greater MetroWest lone soldiers in Israel. For more information contact us at (973) 929-3054. Musical Israel Celebration: Yom Ha’atzmaut/Israel’s Independence Day! Sunday, May 5 • 1 p.m. Celebrate Israel’s diversity with Morris County’s diverse Jewish communities. 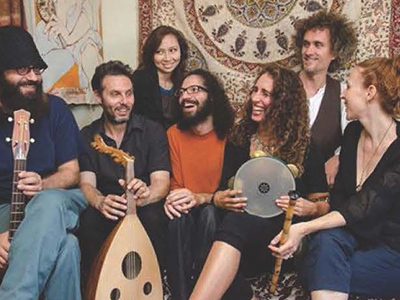 Special Musical Guests: Pharaoh’s Daughter - A joyful, funky, inspiring world-beat, 70’s rock, Mediterranean, Hasidic, Israeli musical adventure! Info/RSVP: PJorlett@adathshalom.net or click here. Monday, May 6 • 4 - 6 p.m. Sample the sights, sounds, and tastes of Israel. Enjoy the art of Israel by decorating a hamsa, visit Ben Yehuda Street and create your own iron-on T-shirt, test your knowledge of Israel by competing in an interactive trivia game and much more. For more information call (973) 992-4571, email amiller@tbsnj.org or click here. 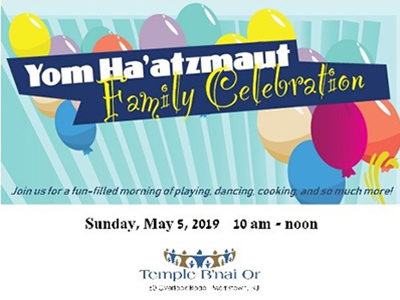 Sunday, April 14 • noon – 4 p.m.
Family fun day highlighting the sites and sounds of Israel with Israeli dancing, henna, Israeli food court, vendor fair, Rishonim and IDF obstacle course, and Little Gym of Roxbury. For more information contact Naomi Bacharach at nbacharach@grtwacademy.org. 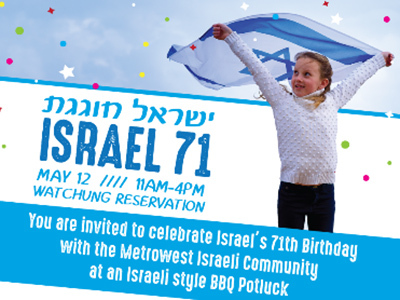 Sunday, May 12 • 11 a.m. – 4 p.m.
Israeli style BBQ Potluck and fun activities for the whole family. For more information contact Tzofim.shevet.arava@gmail.com or metrowestisraelischool@gmail.com. 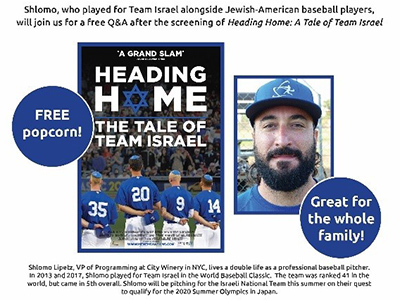 Shlomo Lipetz, who pitched for Team Israel alongside Jewish-American baseball players, will join us for a free Q&A after the screening of Heading Home: A Tale of Team Israel. 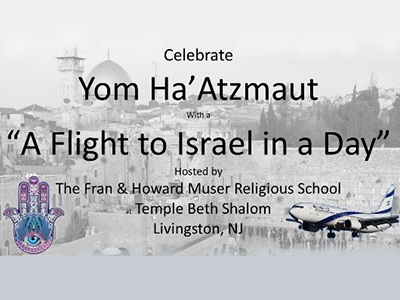 For more information contact Randi Zucker at rzucker@jccnj.org, (908) 889-8800 x253, or click here. Thursday, May 9 • 4:30 – 7 p.m.
Livingston Town Hall, 357 S Livingston Ave. Craft & Activities fair, sports and games, Israeli dancing, Jack’s petting farm, Turtle Back zoo enrichment, Barry Schwartz enrichment. 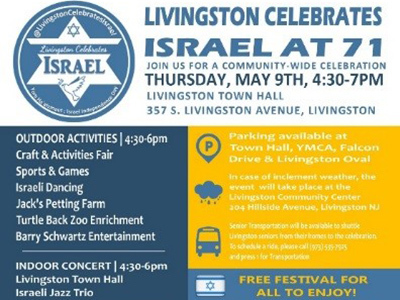 Indoor concert Livingston Town Hall, Israeli Jazz Trio, Israeli flag raising ceremony, Hatikvah by children’s choir. For more information email Livingstoncelebratesisrael@gmail.com or click here. The Kahal will enjoy a variety of stations that will include dancing, cooking, crafts, and other surprises. For more information contact Cantor Galit Dadoun Cohen at cantor@templebnaior.org or David Iskovitz at davidiskovitz@templebnaior.org. 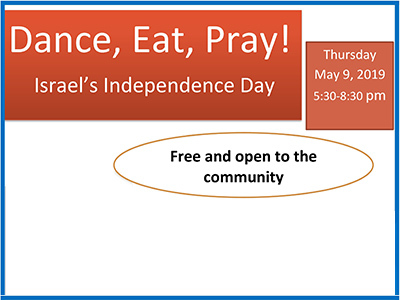 Sunday, May 9 • 5:30 - 8:30 p.m.
Israeli dancing led by Elyse Litt, enjoy falafel and other treats. Special prayers and songs led by Cantor Steve Stern. For more information call (732) 381-8403 or click here. 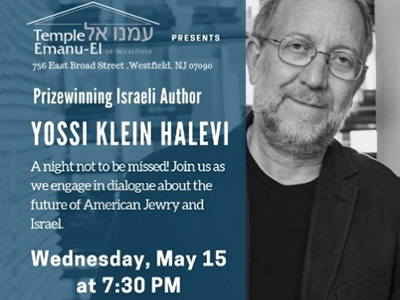 Wednesday, May 15 • 7:30 p.m.
Join us as we engage with prize-winning Israeli author Yossi Klein Halevi to discuss the future of American Jewry and Israel. For more information call (908) 232-6770, email jgrussgott@tewnj.org or click here.